Through my work as a councillor, I became very aware of Men’s shed network in other areas around the country. 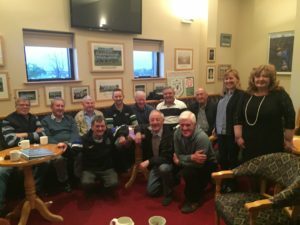 I researched the Irish Men’s Shed association and connected with Men’s Shed leaders from other areas to see if a Men’s Shed in Lucan would be viable. I called a public meeting to gauge interest in March 2017 and on that night we setup Lucan’s first Men’s Shed. The Men’s Shed is steaming ahead and is currently located within the grounds of The Irish Wheelchair Association on the Newcastle Road. I continue to help and support the Men’s Shed in any way I can. If anyone interested in joining the Men’s Shed or just to connect with them then please contact Eamon at 086 8178315 or email lucanmensshed@gmail.com. Alternatively you can contact myself and I can put you in touch.